I started drinking protein smoothies several years ago when I worked through the exercise program P90X. The program’s diet called for daily protein shakes, but given we were in the process of switching over to real food (and avoiding ingredients we couldn’t pronounce), I couldn’t bring myself to knowingly drink something with an ingredient list that looked like a foreign language. So I did tons of research, made lots of smoothies and wrote a book on making protein smoothies without adding protein powder, called High Protein No Powder. I learned that it’s relatively easy to make protein smoothies, so long as you are strategic and intentional with the ingredients you use. First, make sure every ingredient has protein. Many people will use water to make smoothies because it has zero calories, but guess what? It also has zero protein. Second, don’t overlook the protein in fruits and vegetables. Smoothies usually contain bananas because they are great at repairing and replenishing the body after a workout, and they’re naturally sweet. However, one banana also contains 1.6g of protein. One cup of spinach contains nearly 1g of protein and kale contains 3g protein per cup! Third, boost the protein naturally. According to Harvard Medical School, the average sedentary person (someone who doesn’t exercise) needs just 0.8g of protein per kilogram of body weight. To figure this out for yourself, multiply your body weight in pounds by 0.36. Remember though, this is only valid if you don’t exercise. Those who exercise regularly, are pregnant or require a high protein diet need to consume much more. And you’re not going to get what you need in bananas and spinach alone. 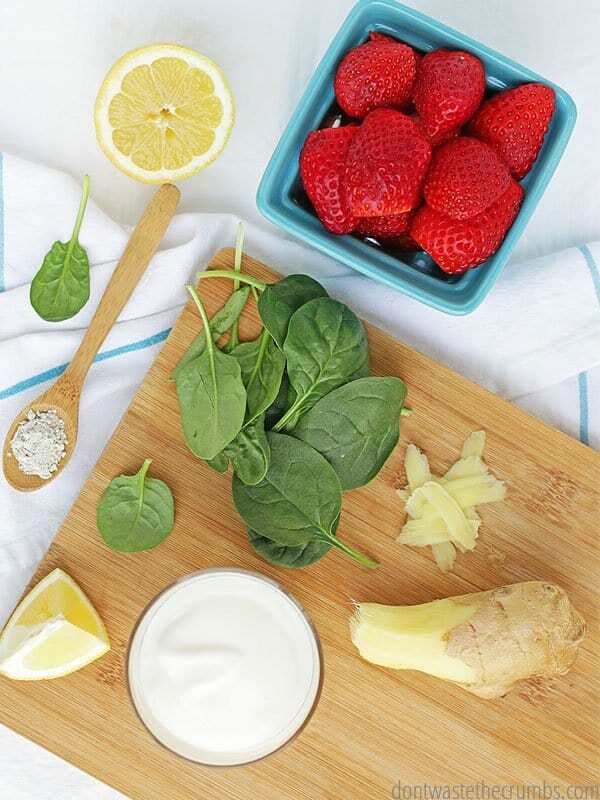 I included over 50 ways to add protein to smoothies in my book High Protein No Powder, but these are some of the easiest ways to make a protein smoothie using ingredients you might already have at home. An unlikely choice I know, but there is 12.6 grams of protein in just ½ cup of cottage cheese! 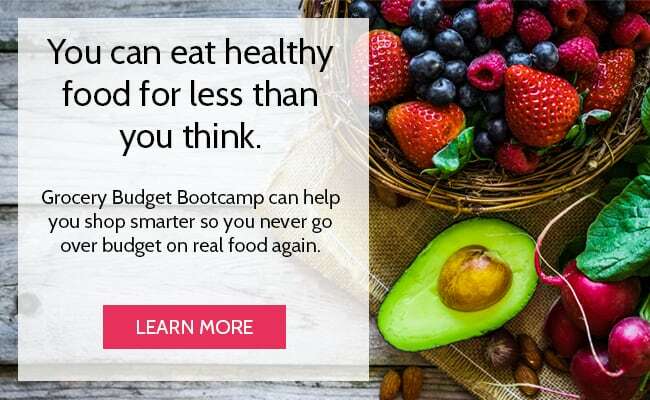 This is one of the secret ingredients to many of my recipes, including the Strawberry Cheesecake Smoothie, Orange Julius and the Mango Tango Smoothie. If you’ve never heard of kefir before, think drinkable yogurt. It’s usually cow milk that has been fermented. You can find my full tutorial on making homemade dairy kefir HERE, as well as the health benefits of kefir HERE. The reason it’s in this list though, is because one cup of kefir contains a whopping 10 grams of protein! Of all the choices of liquids to put in a smoothie, kefir is my top pick. You know how bone broth is so good for you? It’s because of the gelatin that is extracted from the bones when you cook them. 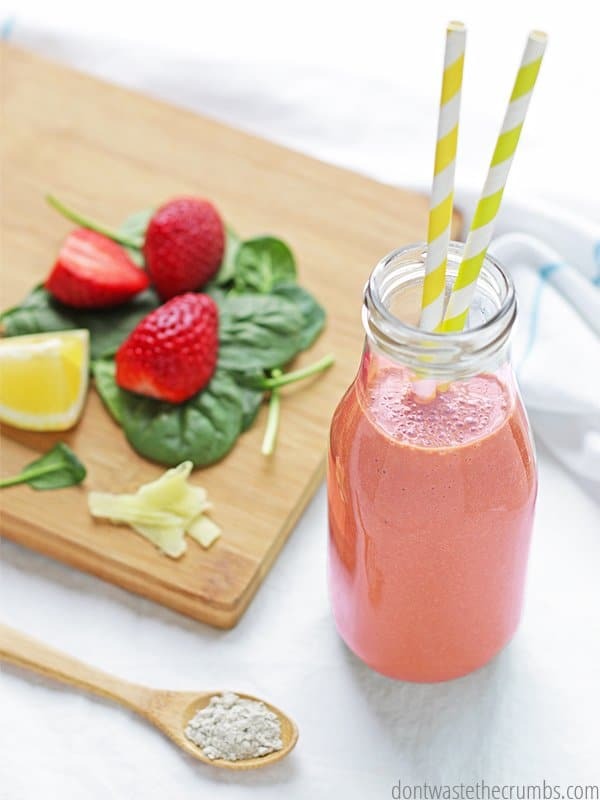 Collagen is uncooked gelatin, and adding a scant tablespoon to a smoothie boosts the protein by 10 grams! By itself, collagen is tasteless, odorless and dissolves without any issues. I add it daily to my green maca smoothie and love the benefits in my hair, skin and nails. It is important however, to buy quality collagen. I recently tested two different brands of collagen and noticed a considerable difference in my hair and nails with one brand – so much so that my hairdresser noticed how fast my hair had grown! The other brand however, didn’t fair so well. When my nails started chipping and my hair started breaking, I switched back to the first brand and within two weeks I saw improvement. All this to say, if you’re going to add collagen to your smoothies, use quality brand. I only use and recommend Perfect Supplements grass-fed hydrolyzed collagen. Psst! 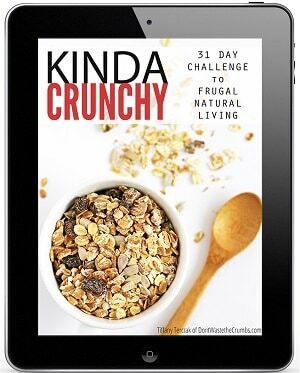 Crumbs readers can save 10% on their order when you use the code CRUMBS10 at checkout! You might be tempted to reach for almond milk, but that won’t get you the most protein per serving. In fact, of all the non-dairy milk alternatives, almond milk is in a 3-way tie for last place (coconut milk and rice milk hold the other two spots at the bottom). On the other hand, peanut milk will give you 9 grams of protein in just a ½ cup! Peanut milk isn’t available commercially in many places, so your best bet is to make it yourself. This easy peanut milk recipe calls for just two ingredients – peanuts and water – and you can sweeten and/or flavor the nut milk however you’d like. If you would rather use almond milk, despite its lower protein content, definitely consider homemade almond milk. It’s super easy and you can avoid the additives that most commercial non-dairy milks have. Plus making your own non-dairy milks is a great way to cut back on your grocery budget. 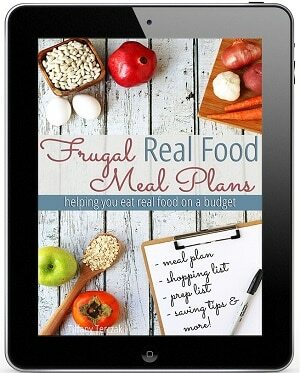 These recipes are super cheap! 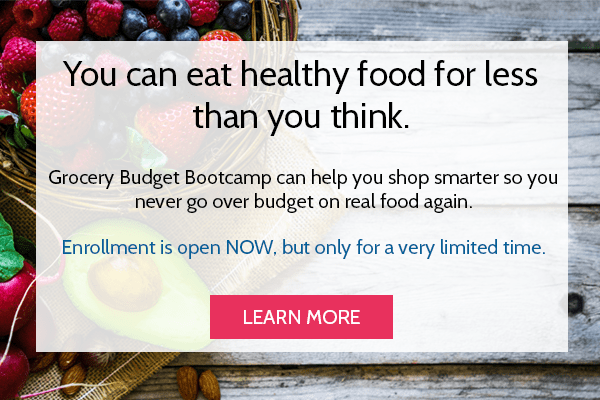 Making things from scratch when it’s worth it is one of the principles I teach in Grocery Budget Bootcamp. If you don’t want to go through the trouble of making peanut milk, how about just adding peanuts to the smoothie? 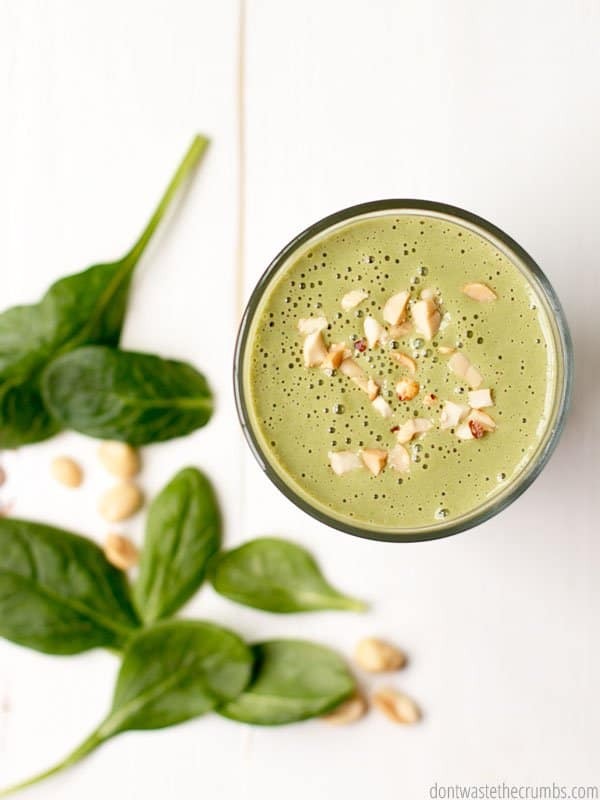 You’ll be boosting the protein smoothie with 8 grams of protein for every 2 tablespoons you add! If your default liquid is cow milk, you might already know that one cup has 8 grams of protein. But did you know that goat milk has 9 grams of protein per cup? Or that sheep milk has 15 grams of protein per cup?! You probably don’t have easy access to a sheep, but definitely consider animal milk as the liquid in your protein smoothie. I’m certainly not trying to sound like a broken record, but it’s fact that nuts contain a large amount of protein and that’s why you keep seeing them on this list. Peanut butter takes first place with 8 grams in a 2 tablespoon serving, with almond butter in second place with 6.7 grams in 2 tablespoons. Cashew butter is next with just 5 grams of protein in 2 tablespoons. You can make your own nut butters following this tutorial here. Hemp hearts are a superfood, high in omega fatty acids, but they’re also high in protein too! Add 2 tablespoons to your protein smoothie to boost the protein content by 6.7 grams. If you don’t think eggs belong in a smoothie, you obviously haven’t tried my eggnog smoothie before. It’s the classic flavor of eggnog, except that its real food, super healthy and available year-round. And oh yeah, it’s high in protein too. Just one egg has 6.3 grams of protein! I have to confess that I’m personally not a big fan of chia seeds. They get gelatinous when they’re mixed with liquid, and it’s a texture that my palate does not care for. But still, they are high in protein. 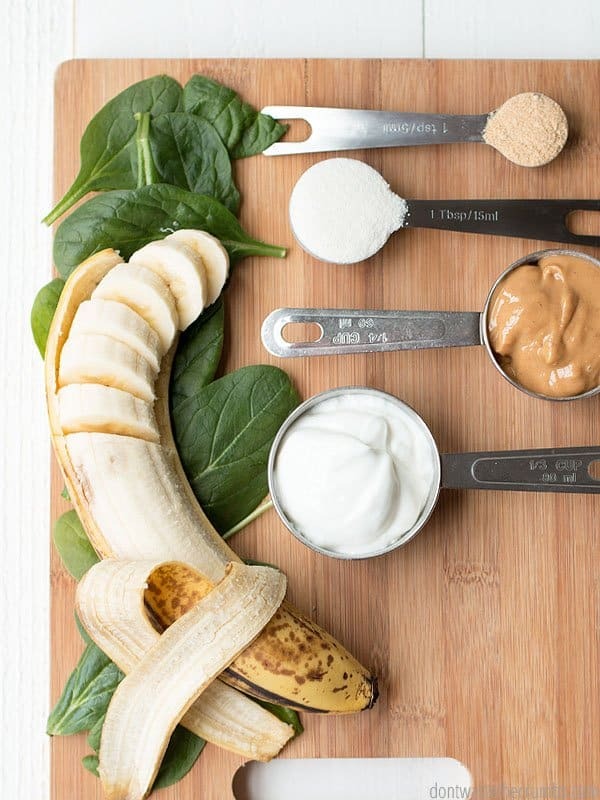 2 tablespoons carry 6 grams of protein, and will work in almost any smoothie thanks to their neutral flavor. I bet you thought this would be higher up on the list, right? Greek yogurt is definitely a high ranking source for protein – 6 grams in just ½ cup – but this post proves that it’s not the only source. In case you were wondering, plain yogurt did NOT make it to this list. It’s a “so-so” source of protein – 4.3 grams for ½ cup – but Greek yogurt will really give you the boost you’re looking for. 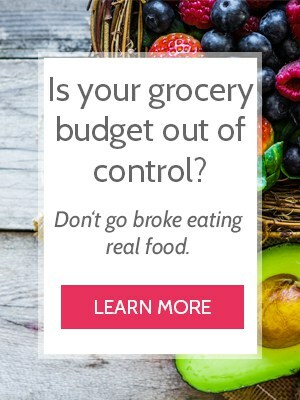 Also, you can save TONS of money by making your own yogurt. I use this easy yogurt tutorial and it’s never failed me, ever. Once you have a batch of homemade yogurt ready, you can turn it into Greek yogurt using the tutorial right here. Easy peasy! Before you balk at the fact that I’m suggesting you add beans to your protein smoothie, here me out. We use them to make brownies, and you love those, right? We use them to make chocolate hummus, and you love that too, right? So then trust me when I say adding a ¼ cup of beans to your smoothie WON’T ruin it and you won’t even notice they’re there? 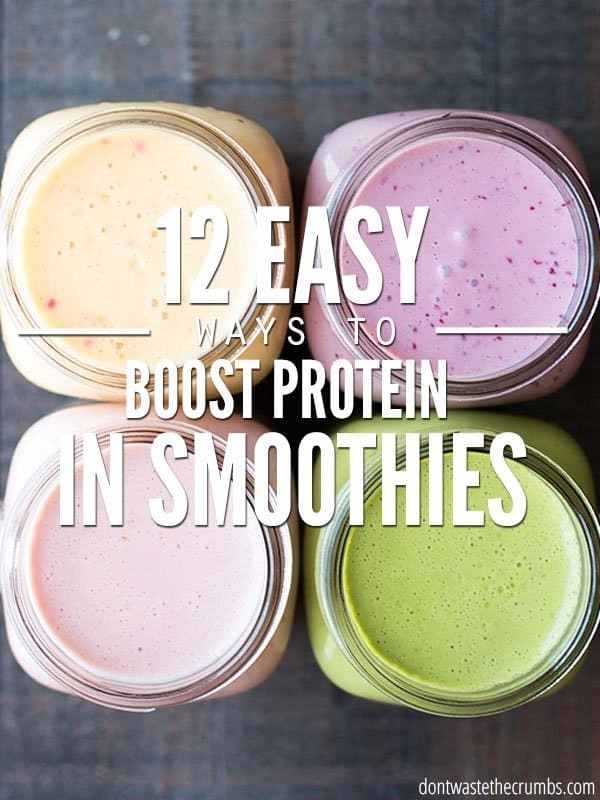 Besides, it’s an easy way to add 4.4 grams of protein to your smoothie. After crunching numbers and comparing dry beans to canned beans, it turns out that dry beans really are the better deal. Be sure to soak and de-gas the beans with this method first so you’re not dealing with aftermath later in the day. Also, making a big batch of beans in the slow cooker at the start of the week makes it super easy to scoop out ¼ cup and add them to your morning smoothie. For more ways to boost protein in a smoothie, check out these 7 cheap & healthy protein sources. If you’re looking at collagen, I recommend Perfect Supplements. I did an impromptu comparison of the top two brands on the market and Perfect Supplements came out on top by a landslide. Be sure to use coupon CRUMBS10 to save 10%! I found 38+ other ways to boost the protein and included ALL of the options, including vegan, in my book High Protein No Powder. What do you add to your protein smoothies? Leave your ideas in the comments below! Hi! Can you mention which collagen brand you tried that you didn’t like? I understand and appreciate you not wanting to bash! Thank you for sharing! They were the brand I was planning on trying, so thank you for a better option! We have been using Vital Proteins Collagen Peptides for over a year now and we love it! It is unflavored so we can add it to anything we eat or drink, it has done wonders for our skin, hair, and nails and we order it online through their site (usually with a discount) and it is delivered right to our door. Have you ever tried it? 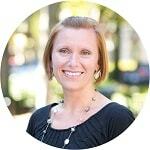 Hi Tiffany, I am wondering what can I mix with protein shakes since I have type 2 diabetes. I am not sure if I can add all these ingredients that will not put my blood sugar high thank you. Hi Rachelle! I’m not a doctor and I don’t have experience with diabetes. I’m so sorry I don’t have any details to help with this!